Worbla is a thermoplastic, popularly used for cosplay armor because it is so easy to work with and the resulting armor is quite durable. 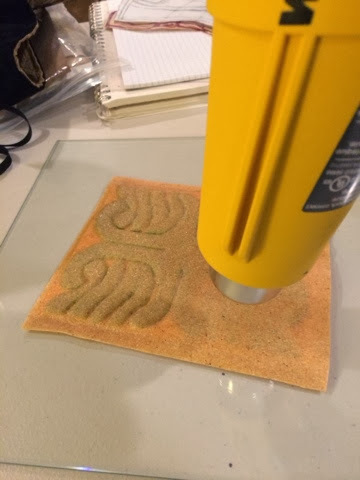 You can cut it with a good pair of scissors and you can mold it by hand after heating it up. Also, there is virtually zero waste because you can heat up the scraps and use it like clay to create detail ornamentation. Worbla armor is usually created by sandwiching a stabilizing piece of craft foam between two pieces of Worbla. 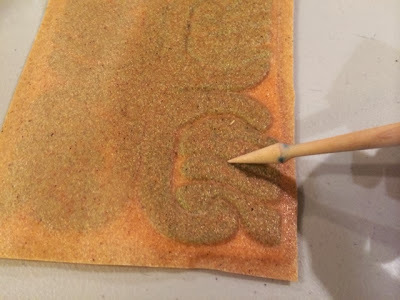 Here's how you can create a relief design using inexpensive craft foam instead of using extra layers of expensive Worbla. 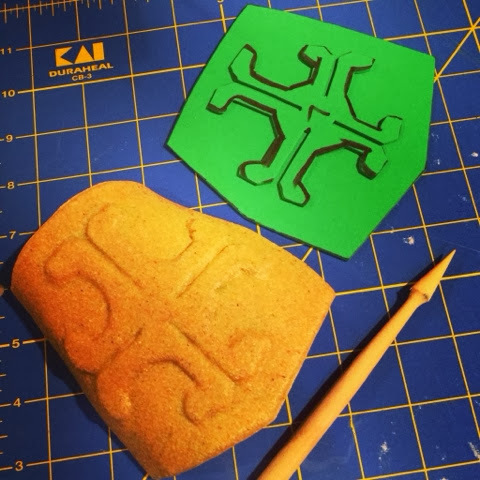 The relief pattern will have smooth edges like an embossed design; if you layer Worbla instead you will have sharper edges. Cut out your design in craft foam and glue it to your craft foam pattern piece. 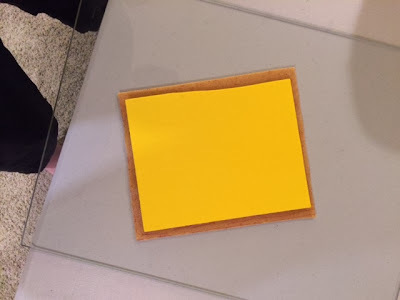 Then layer Worbla over the craft foam and use a pointed wooden tool to press the thermoplastic down around the edges of the design. 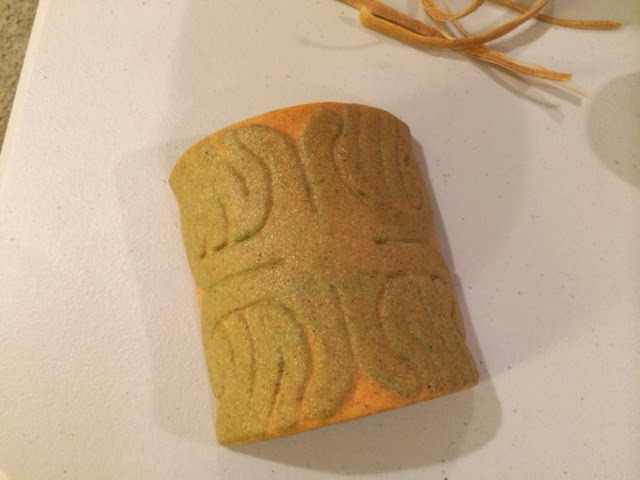 Here I layered my design in green foam over yellow. The yellow will become my pattern piece for an upper-arm plate. 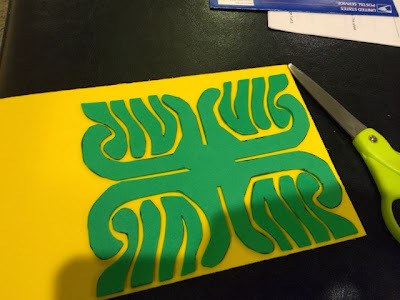 First I heated a piece of Worbla, then stuck the pattern piece on it with the green design side against the shiny side of the Worbla sheet. Then I flipped it over. 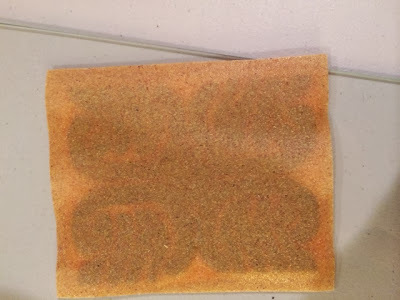 Here you can see how it helps to use contrasting craft foam colors. You can see the darker green design through the plastic. 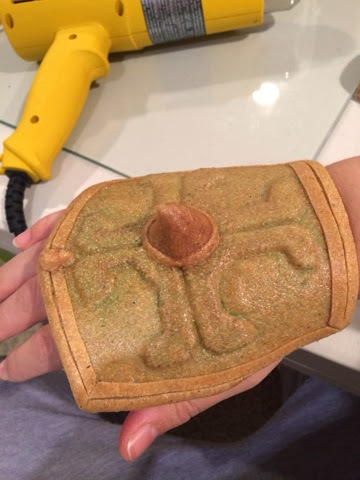 I can use my fingers to feel out the design and start to press the Worbla down, but it is much easier if I can see the pattern. Next, I used the pointy tool to press the heated Worbla down around the design shapes and get nice, smooth edges. The Worbla cools and hardens pretty quickly so I heated and worked on one quadrant of the piece at a time. 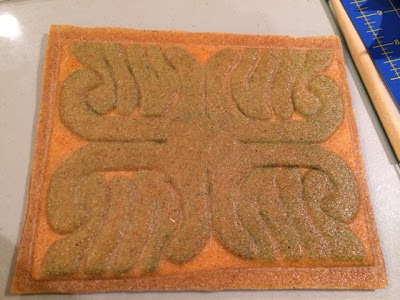 After finishing the relief, I heated a second piece of Worbla and stuck it to the back of the craft foam. Then I pressed the edges together to seal in the craft foam (sandwich!) and trimmed the excess. Save your Worbla scraps, you can heat them up and use them for decorations, like claws and scrollwork! Lastly I heated up the whole piece and curve it into shape around my upper arm, then let it cool. Here's the hand plate with ornamentation added. On this piece I used both the craft foam relief technique and also layered strips of Worbla for the edge details.